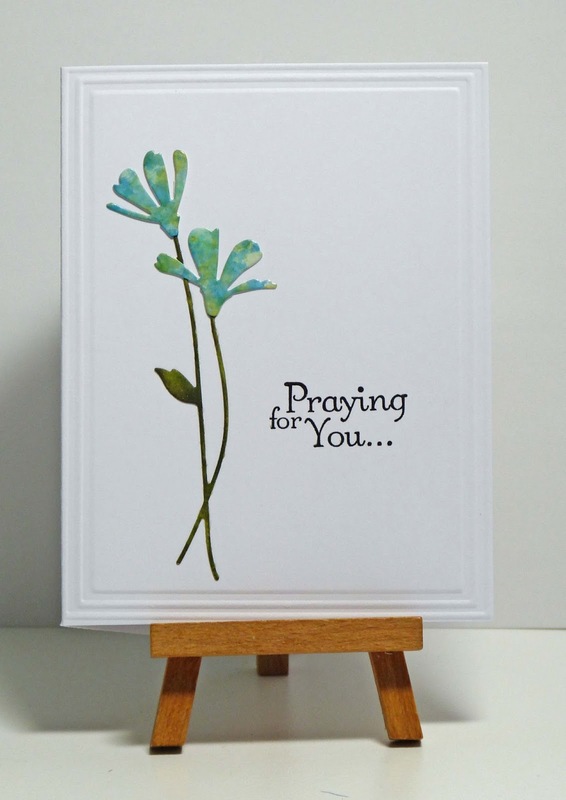 Cathy's Card Spot: Blue & Yellow flowers. Hi again, been playing with alcohol inks, blending solution and isopropyl alcohol! These flower tops are diecut from glossy cardstock that has been pounced with a couple of blues and butterscotch alcohol inks. I added some blending solution to the pad and pounced some more, then I sprayed with isopropyl alcohol. Not much changed on the cardstock but I was excited by what happened on the yupo paper! (my next card to be posted). 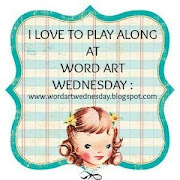 Word Art Wednesday where the theme is anything goes. CAS MIx Up Card Challenge where in addition to stamping you need to use liquid colours and at least one other technique. I've used die cutting, wet embossing on the sentiment and dry embossing on the frame. 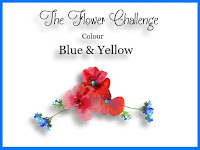 The flower Challenge where it's a colour theme to use blue and yellow. 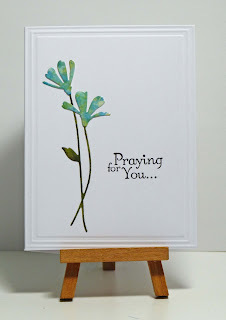 My colours have blended into a bit of green so I hope that's ok.
Simon Says Stamp fresh daisies die; glossy card; alcohol inks; distress markers for the stem; Stampin Up Thoughts & Prayers sentiment; versafine ink & clear ep; Stately embossing folder. Beautiful flowers, Cathy! I love the pattern you accomplished with the alcohol inks! Perfectly CAS too! Thanks so much for sharing this with us at CAS Mix Up! I love that daisy, such a pretty card. I love this so much!! Its a gorgeous CAS design, so crisp and clean. And would never have thought to create a flower mixing blue and yellow together. Its genius and I'm so glad you shared it with us at The Flower Challenge!! Cathy, you have really nailed this alcohol inks thing. What a stunning looking creation, you are really making me look beyond what I have been doing with my alcohol ink pieces. Stunning,thank you so much for joining us at The Flower Challenge this month. Your support is really appreciated.